To eat or not to eat? That is the question I regularly ask myself when I see radishes at local growers’ markets. I am just now growing to like radishes, but for years my mental picture has been that they are mostly too bitter. In fall I’m happy to eat the long, white, fat carrot-shaped daikon radishes that are sweeter and a lovely addition to spring rolls or grated on salads. I’ve also come to like fall’s peppery black radishes with a good cheese and dark beer, but it’s spring radishes that keep me searching for new serving ideas. Why bother? For me, it’s mostly because they are so plentiful at market, they pack a nutritious punch and when most everything else at market is green, it’s hard not to be attracted to this early season crop for its splash of color. For inspiration, I looked to Korea, where pickled vegetables are a mainstay, all varieties of radishes are enjoyed in dishes like kimchi, a traditional fermented dish made of vegetables with a variety of spicy seasonings. In Korea, kimchi is made differently for each season. In spring, herbs are added and it is consumed while fresh rather than fermented. Summer brings the addition of seasonal vegetables such as cucumber. In fall, extra salt is added to preserve the kimchi longer, and in wintertime, pine nuts, pears and chestnuts are added. Fermenting foods has been around for a long time and was used as a way to preserve foods. Today, fermented foods are recognized for their active bacteria cultures, which help promote the growth of friendly intestinal bacteria, and aid in the digestion and support of the immune function, including an increase in B vitamins, omega-3 fatty acids, digestive enzymes, lactase and lactic acid, and other immune chemicals that fight off harmful bacteria and possible cancer cells. Lo and behold, kimchi — a food I first discovered during grade school when a Korean friend’s mother regularly made this spicy salad — is the perfect vehicle to transform spring’s red radishes. 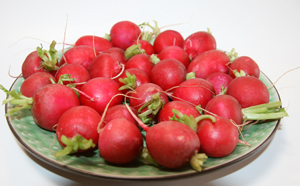 Look for radishes that are nice and firm in texture. Their top greens should also be crispy without any yellow, shriveled leaves. When buying produce at your local growers’ market, you can be nearly certain it has been picked within about 24 hours of your visit, so your radish selection should be easy. Once at home, remove the top greens just as you do for carrots, as they rob the roots of nutrients. Wash them thoroughly in clean water and store them in a plastic bag in the refrigerator where they will remain fresh for up to a week (or longer). If using the radish greens, cook them as soon as possible. It’s a good thing there is no need to peel radishes, as the isothiocyanate antioxidant compound which gives them a peppery, pungent flavor is concentrated in the peel. If you have to peel, gently pare away a superficial thin layer only. Radishes are also a very low-calorie root vegetable and are a good source of antioxidants like vitamin C, electrolytes, folates, minerals, vitamins and dietary fiber.